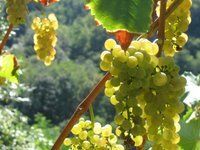 All of the Primorska region is making wine. The rains of August have stopped and the sun has warmed the grapes into a luscious sweetness. 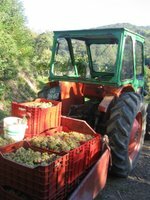 Tractors grumble on the roads pulling red, gray or green plastic crates behind on a metal platform over flowing with black-purple or golden grapes. The fruit flies are in heaven. 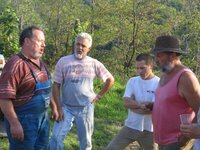 We pile into Joško’s ancient Russian made small land rover and bump up and up a narrow wagon path past rows and rows of grapes belonging to friends and family from the valley. How Joško knows which vines are his I have no idea, but there seems to be no confusion as to where he is going. 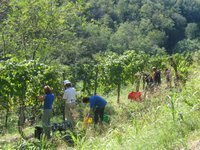 We each have a bucket and pruning shears and we start first with the pinot grigio, then to the muscat and then the zelen, a native white grape. The cut grapes drip with sun warmed sweetness oozing sticky down my arm. Some are huge translucent bunches; the others are tight clusters wrapped around the wires and vines and difficult to cut off. The grapes are small this year, but sweet. July was a drought, August there was too much rain and September has been sunny and warm. With the high level of sweetness the wine will have a higher alcohol content, 13% is expected and no sugar will be added. Tanya and Miloš pick their grapes and put them in a large plastic vat for 3 days. They crush and stir the mixture and keep the vat covered with a giant piece of canvas. After the 3 days they drain the juice into a galvanized vat and press the pulp in a machine to extract the remaining juice. They leave the juice to ferment in the vat with a valve allowing the gas to escape flavoring the air with a sweet tang. Over the next 10 weeks they transfer the liquid to other containers a couple of times and throw away the sediment. 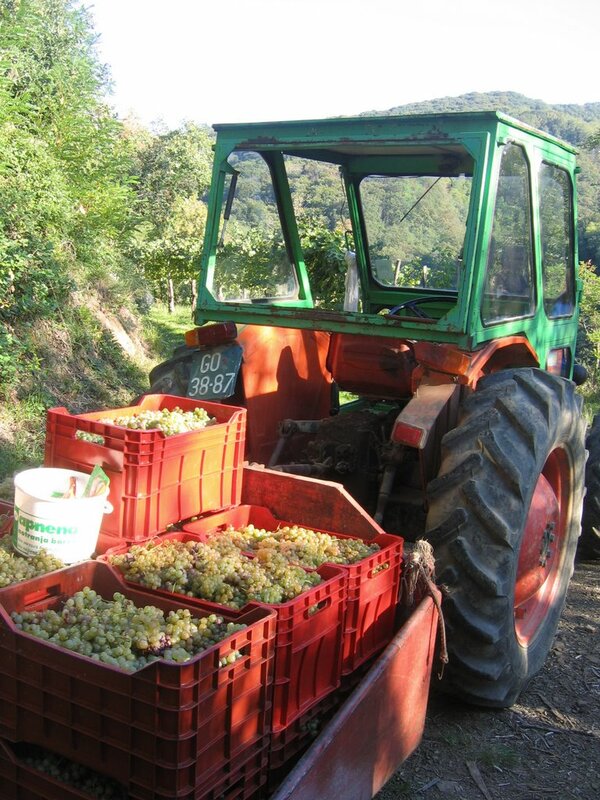 On 11 November St. Martin turns the juice into wine, the common drink for all occasions for the rest of the year. Homemade wine is poured directly from the vat and served in plastic bottles that once held water and no one seems to worry about oxidation or the fragile qualities of wine, they just enjoy the sweetness of the nectar of the gods. Because Joško makes more wine than Tanya and Miloš the process is more elaborate. 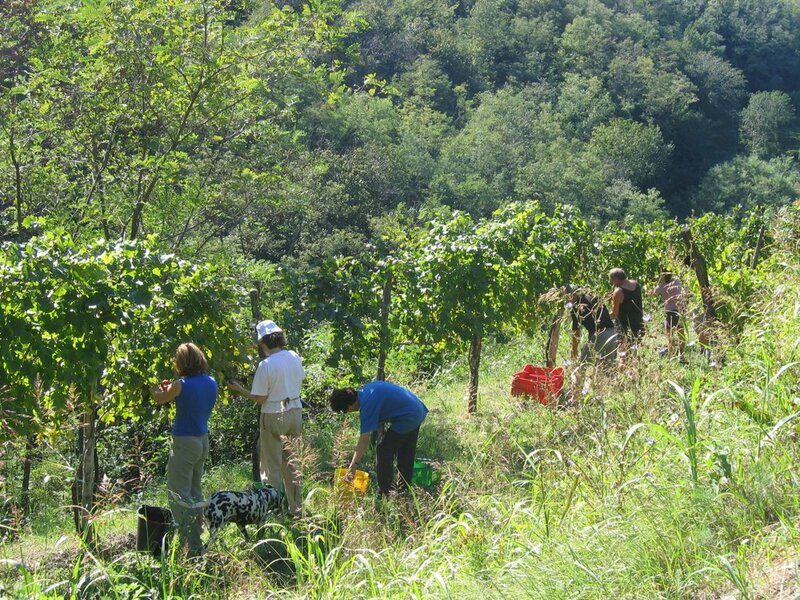 There were a dozen friends and family who pick buckets and buckets of grapes for hours. The crates are loaded on tractors and trailers to be dragged down the hill to the house. In the garage the sticky sweet grapes are put in a grinder that removes the stems and then the grapes are pumped into a press. The slurry sits all night to strengthen the bouquet of the wine and in the morning the press will extract the juice and send it through a tube directly to the vat in the wine cellar. After all the stickiness is washed off our hands and tools we sit around the large table in the wine cellar and are served a meal that matches our hunger. Barley soup, fried eggplant, tomato slices, prušt, potatoes, zucchini quiche, salad, pork, chicken and apple strudel all served with 3 kinds of zelen wine that was made in 3 different vats, and each tasting remarkably different. All this food is accompanied with extreme bouts of laughter and wild attempts of speaking Slovene, Italian and English. Once the juice is pumped into a vat it is then pumped again through a larger vat that has an outer envelope wall holding cold water, which cools the temperature of the juice. Sulfur is added to aid clarity and gelatin is added to help the sediment settle to the bottom of the vat. The fermenting juice will be transferred a number of times to clean vats and the sediment is disposed of. While cutting grapes my partner cut my finger instead of a cluster of grapes. It was a deep gash close to the nail of my index finger that refused to stop bleeding. Since I donated my blood to the cause of this wine we have now labeled a vat “Kay’s Wine”. Each week after choir practice I test “my wine” tasting its process of becoming wine. Three days after the picking, the juice begins to have a little tang of fermentation, but still tastes good, the second week the juice flavor is even tangier, the third week the liquid was a dull cloudy mustard color and the taste no longer resembles the juice flavor. It lacks the rich sweetness, but instead is a tad bland bitter flavor. The fourth week the liquid was still cloudy, but is becoming a golden color and the flavor has the hint of wine; it is definitely taking a turn to satisfy the palate. In three more weeks the miracle of juice to wine will be complete and Bacchus and St. Martin will join hands across time for all cultures to celebrate.